While preparing for this week's solar eclipse (with special glasses and coffee milk), Kevin and Kornflake catch up on their latest goofy summer activities, including: The Aquabats and CJ Ramone together in Boston; Niki Luparelli and the Gold Diggers under the stars at a science museum; Micky Dolenz and Billy West at the Boston SouthCoast Comic Con; Elvis Costello and the Imposters in Providence, Rhode Island; a visit to Alice's Restaurant in Stockbridge, Massachusetts; Petty Morals and Elettrodomestico (with Jane Wiedlin of The Go-Go's!) in Plymouth; and the Retro Futura tour, featuring a heap of classic 80s performers (Katrina, Paul Young, Modern English, English Beat, Men Without Hats, and Howard Jones). Then it's the shocking conclusion of our ten-part High Feather series review! In this week's "Food Follies" episode, our summer campers are singing, dancing, and hiding behind giant vegetables... and perhaps it's for the best that this is the end. Also: The return of Robolar! It's been decades since we last saw our favorite Boston-accented, Earth fruit-chomping Martian from that classic PSA, but now thanks to some friends of the Flopcast, Robolar is back. This is crazy. We're also celebrating the 87th birthday of Sean Connery (you remember him from such films as DragonHeart and Zardoz), and we wrap up this extra-long show with some Chickens in the News, as a giant angry chicken balloon arrives in Washington to join the resistance. Next week, at last: Our DragonCon preview. Get ready. 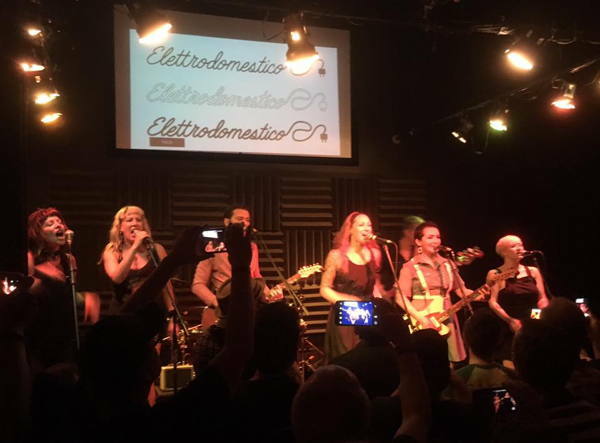 Petty Morals and Elettrodomestico: worth driving all the way to Plymouth for! 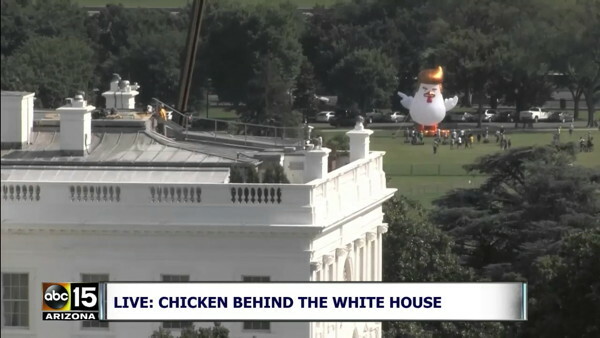 Chickens in the News takes a trip to Washington, DC, where a giant inflatable chicken was installed by Taran Singh Brar.